Ebenezer Christian Children's Home is thankful for the support of the community through service projects. Our volunteers make the ministry of Ebenezer possible. If you would like to serve Ebenezer through a volunteer project, please view our volunteer page for more information. We are blessed with so many amazing young people that choose to complete their senior project for Ebenezer’s. April is the young lady pictured who was in our care several years ago. When she first came into care, her belongings were put into trash bags. This was her motivation for her senior project. She involved her apparels class and made these beautiful duffle bags that were donated, which will help share the message to the children that receive these that they are worthy, special, and loved. Thank you April! Many thanks to Heather Johnson for the creative superhero capes and tutus that were made and donated to the children at Ebenezer’s. They love them and have had so much fun playing in them. It’s great seeing them put their imaginations to work! Kellie is a very special young lady who, for the second year, has blessed our children with a gift from her heart. She is pictured here surrounded by the adorable “buddy bears” she made and donated to Ebenezer’s to provide a comforting friend for the children. Thank you to Millers Creek Elementary School Beta Club who collected, organized, and delivered ONE HUNDRED “birthday boxes” for the children of Ebenezer! These extraordinary boxes each included a gift, cake mix, icing, birthday plates, candles, and decorations. A whole party in a box… talk about a blessing! Thank you also to the delivery elves, Mrs. Jenni Roope and her daughter Grey! Kendall Hendrix, president of the Foothills Corvette Club, and wife Derry made a visit to Ebenezer’s to bring us a Christmas gift. Many thanks to the club for their thoughtful donation that helps us to continue to provide a safe place for our children to laugh, play, and dream. Ebenezer's Attic was honored with the community member votes in the Journal Patriot's Best in Wilkes, Best Secondhand Store. The Attic always has great gently used or new clothing as well as home goods, at a price point that can allow anyone to pick out something nice for themselves, their children and families, or their homes. All the money does come back to serve the children at Ebenezer Christian Children's Home. Jean Davis, executive director of Ebenezer Christian Children's Home shared that "we opened Ebenezer's Attic in hopes of being able to bless our community. Without our community's support, our exceptional volunteers and dedicated staff at the Attic, none of this would be possible. We are so thankful to each one, and humbled to be recognized by our local supporters". 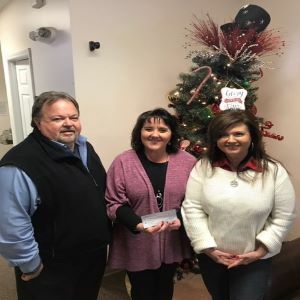 Wilkes county and the surrounding area is full of people who are willing to help, and donating to Ebenezer's Attic is an easy way to give back not only to the community, but also to the children of Ebenezer Christian Children's Home. Ebenezer is appreciative of all of the continued support from the Red Knights, Blue Knights, and Guardians of Children groups, and most recently, for their donation of over 30 new backpacks filled with school supplies for each of the kids. We are so thankful for all you do for our kiddos and for helping them get ready to head back to school!